Great. One aircondition not working and the staff seem not to understand. I booked because it looked like a better alternative than NTK, where I usually stay when I travel this area. Overall, it was an OK experience but with some negatives. The room was not cleaned while I was there for two nights and looked like the floor had not been cleaned lately. The selection for English TV channels is not great, no movie channels. Staff do not speak English. The bed is very hard. Location is not conducive to access, unless you have your own vehicle. Wifi was very slow. On the positive side, air conditioning works fine. There is a local market next to the hotel with local cuisine. American breakfast was ok at the hotel restaurant. The hotel is fairly new and rooms and furniture reflect it, though attention to cleaning the floors would help a lot. Rooms are no-smoking but each room has an ash tray. My room had a faint cigarette smell. If you are a smoker this is fine, but non-smokers might find this to be problematic. It was clean, spacious, & I loved the fitness area. 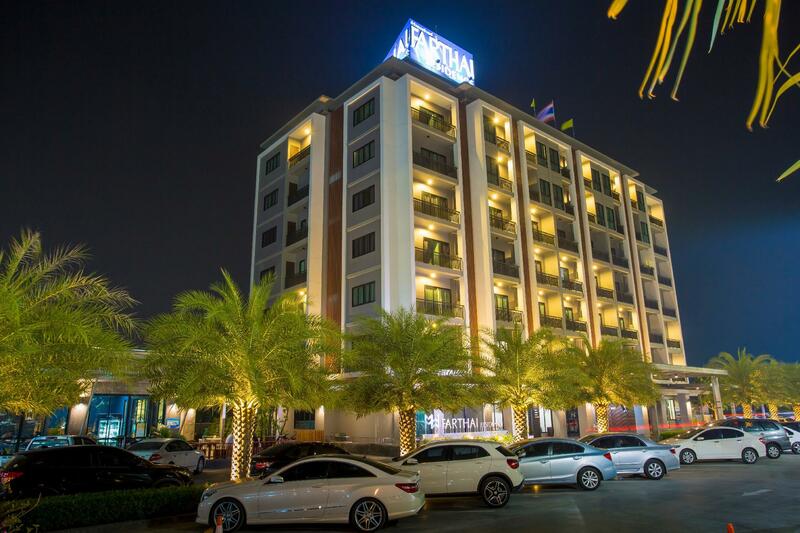 I really enjoyed my stay at Farthai. It was very comfortable & peaceful. I would return if I were to stay in that area again! It will be an excellent experience if most of them in front desk speak english. Infact not many of them able to do that. However, one front desk staff doesn't speak english as well, but out of initiative, she try to communicate with me in Chinese and, all my problem solved! Do not miss-understand, unless you're going to those tourist hotspot, but not all the hotel staff in Thailand is friendly. And you should be grateful if you can find one. However, be careful on the following when you make reservation for this Hotel from Agoda:- 1) Breakfast ------------ The price shown here may not include breakfast, read carefully on all the fine print before you confirm this. However, a restaurant operated by the hotel is just located next door, so you can have your breakfast even if they don't include that. 2) Type of room --------------- I'm very sure I have made the reservation for Deluxe Room, but when the Confirmation Letter come out from Agoda, it was changed to Studio Room. I personally think that this is Agoda's problem, unfortunately I don't print screen on every page I browse here, so, no evidence. And as usual, Agoda won't care about this. So, just be extra careful. 3) No Taxi available -------------------- I'm not sure why, but this is the case. I feels like I get more than what I paid for. Room was clean and luxury. I like the concert of the room and shower was great, you can choose either a shower tab or raining tab. Hotel is in good location but not easy to find if you don't have navigation, there is a night market next to the hotel which full of foods. Now what you need to know is that you will need to pay 200 baths extra per person to access to gym, swimming pool steam room etc but its fully worth it. I would definitely come back here again. It was great new hotel right location for my purpose close motorway and Amata .Clean and large room very good staff. 10 mins to Amata Nakorn Industrial Estate. Good for Business Trip. Very Comfortable. And perfect restaurant with variety of Beers!. Just next to the door!